Home » Archive by category "Ask the Designer"
With so many materials to cover our walls with these days, why choose just one? 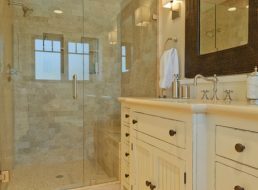 Learn the techniques on mixing materials in your bathroom. Asian style design is restful, peaceful and serene. Learn the basics so you can start transforming your own bathroom today! 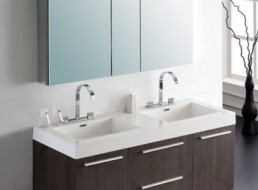 There are countless styles of vanities available, choosing the right one can be a challenge. 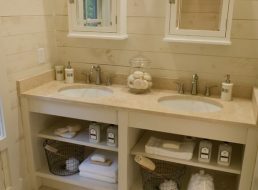 Open shelf vanities can solve your problems with beauty and practicality. The color red is invigorating and exciting. Learn tips on correctly using it in your bathroom. Contemporary design is clean, refreshing and elegant. Learn the basic elements of contemporary bathrooms in order to introduce some into your own bathroom! 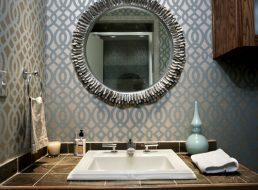 Can You Mix Metal Finishes in the Bathroom? Mixing metal finishes in the bathroom can be confusing and overwhelming. Get some tips from our designer on mastering this design feat. Black and white: the ultimate classic color scheme. You cannot go wrong with black and white — and you can add a pop of any other color to make it yours. 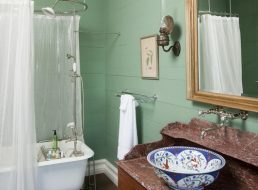 Vintage bathrooms are charming and unique. Get the basics on vintage design quickly so you can head to the flea market! Blue and silver is classic, serene color scheme. 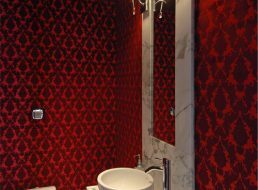 Consider transforming your bathroom through the use of color today! 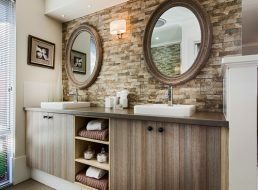 Bathroom Remodeling Guide: What is Appropriate Height for Mirrors, Sinks and More? Bathrooms must be thought of in three dimensions. Learn how to decide where to hang your mirror or toiler paper holder, or maybe even what you should be adjusting for a more functional space.